2) calyculin A (a phosphatase inhibitor) blocks PARP proteolysis, and 3) the electron transport inhibitor rotenone (at complex one) has no effect on PARP proteolysis. Programmed cell death, apoptosis, has been the subject of intense research due to the elucidation of its role in a myriad of biological and pathological conditions. Distinguished from necrosis, the process by which accidental cell death occurs due to acute injury (mechanical or chemical), by Kerr et al. (1972), apoptosis has been shown to play a central role in normal developmental and cellular processes. In tissues, apoptosis affects scattered individual cells in contrast to the tracts of contiguous cells affected by necrosis (McKenna, 1996). Consequently, the potential importance of apoptosis is immense. Defective apoptotic machinery may contribute to numerous diseases. Specifically, loss or degregulation of apoptotic pathways may be a causal factor in cancer proliferation and a multitude of autoimmune disorders, whereas heightened apoptosis, leading to an increased level of apoptotic mechanisms may contribute to neurodegenerative disorders and immune deficiency states (i.e. human immunodeficiency virus infection). In cardiac development, apoptosis allows for the removal of unwanted cells and suggests a key role in the postnatal morphogenesis of the sinus node, atrioventricular node, and the His bundle (James, 1994). Pathological occurrences such as ischemia, infarction, and reperfusion injury may also cause cell death through apoptosis. Much of what is known about the apoptotic response and its biochemical components comes from discoveries utilizing the model organism Caenorhabditis elegans (Hengartner and Horwitz, 1994a). From these studies, two genes in particular, ced-3 and ced-4, have been shown to be crutial componants for normal functioning apoptotic pathways. A third gene in particular, ced-9, has been shown to counteract ced-3 and ced-4 functions, implying that ced-9 may bear an inhibitory effect on some apoptotic pathway. Yuan et al. identified the mammalian homologue of the ced-3 gene as the proteases of the interleukin (IL)-1_ converting enzyme (ICE) family (1993). Furthermore, Bcl-2 was identified as the mammalian homologue to the ced-9 antagonist gene (Hengartner and Horwitz, 1994b). Recently, several ICE-like proteases have been identified (Kumar, 1995), and it is now known that other members of this family, such as CPP32 (Fernandes-Alnemr et al., 1994) and ICE-LAP3 (Duan et al., 1996) are involved in carrying out the apoptotic response. Conversely, bcl-2 protects cells that are overexpressing ICE, thus blocking the apoptotic process (Miura et al., 1993). While many components involved in the apoptotic machinery have been identified, specific roles for each have yet to be assigned. Among the unassigned elements are the stress activated protein kinases (SAPKs). SAPKs are members of the extended family of mitogen-activated protein (MAP) kinases (Kyriakis et al., 1995). Upon its activation by a death signal such as tumor necrosis factor (TNF)-alpha (Westwick et al., 1994), transcription of c-jun is greatly enhanced. As shown by Xia et al., overexpression of SAPK induces apoptosis whereas its inhibition conferes with the apoptotic response (1995). The tumor suppresser gene p53 also plays a role in apoptosis. The results of knockouts of the p53 gene in mice done by Clarke et al. (1993) and transfection of cells done by Lowe et al (1993) both implicate the p53 gene as a mediator of apoptosis. Even with the multitude of identified components of apoptotic pathways, much evidence is still forthcoming about the regulatory pathways involved in activation or inhibition of such components. Recently, the sphingomyelin/ceramide- mediated pathway has gained attention as a mediator of apoptotic pathways due to the role of pathway inducers in stimulating the apoptotic response. Furthermore, Hannun (1996) showed that ceramide concentra- tions within the cell increase in response to these inducers prior to the cellular effects of apoptosis, while Obeid et al (1993) showed that the treatment of cells with cell permeable ceramide induces apoptosis. Interestingly enough, even with evidence pointing to a ceramide mediated apoptotic process, much has yet to be learned about about the specific steps involved. Recent studies of the ceramide pathway have shown a mitochondrial role in its regulation. It has been shown that the mitochondrion swells prior to apoptosis (Matthews, 1983) and its respiration chains are damaged in the early phase of cell death (Schulze-Osthof et al., 1992). With its central role in ATP synthesis, damage to mitochondrial function leads to decreased ATP levels and consequential cell damage. Furthermore, Lennon et al. (1991) showed that reactive oxygen species (ROS) are implicated in apoptosis, and with mitochondrion being the main source of ROS, the mitochondrion implicated in playing a direct role in regulated apoptosis. Moreover, Lanord et al. showed that the oxidative stress caused by these ROS decrease the activity of the mitochondrial respiratory enzyme complex I (of the electron transport chain). Another possibile link to apoptosis lies in the mitochondrion's release of calcium ions. Richter (1993) has shown that calcium levels are heightened during the apoptotic process. Yet with all the potental roles and pathways leading from mitochondrial processes, no definitive evidence links mitochondrial function to the apoptotic response. Using C6 ceramide assay studies, we have begun to further dissect and elucidate the role of the mitochondrion on ceramide dependent apoptosis. Specifically, we show that phosphatase inhibitors and mitochondrial electron transport chain blockers effect the apoptotic response in cells following a ceramide regulated cell death process. The RPMI-1640 medium was purchased from Gibco. The hygromycin and fetal calf serum (FCS) were obtained from Cal Biochem. The EDTA, Tris-glycine, sodium dodecyl sulfate (SDS), rotenone, calyculin, and Enhanced Chemiluminescence (ECL) Western Blotting Detection reagents were purchased from Sigma. Anti-cytochrome c antibody and anti-PARP antibody were obtained form Pharmingen. Bio Rad provided the goat-anti- mouse antibody and the goat-anti-rabbit antibody. The C6-ceramide and the poly- acrylamide gels were made in the lab. Molt-4 leukemia cells were obtained from Duke University Medical Center. All cell lines were grown in RPMI-1640 medium with 10% FCS and hygromycin. The cells were grown at 37&deg;C in an atmosphere of 95% air and 5% CO2. Cell cultures were split every 3-5 days. Molt-4 leukemia cells of 2 x 106/ml were diluted to 5 x 105/ml in 2% FCS/RPMI and treated for 0, 2, 4, 6, or 8 hours with 20µM C6-ceramide. Cells were harvested by centrifugation, suspended in 150µL of lysis buffer with sucrose (6µL saved for PARP proteolysis) and lysed for 10 minutes at 450 psi by nitrogen cavitation. The mitochondrial pellet and 100,000 x g supernate were retained and the protein concentration was determined so that cytochrome c release could be observed using Western blot technique. PARP proteolysis was simlarly observed using Western Blot technique. Molt-4 cells of 1.35 x 106/ml were diluted to 5 x 105/ml in 2% FCS/RPMI. Cells were co-treated for 8 hours with 20µM C6-ceramide and varying concentrations of calyculin. Cells were harvested by centrifugation, rinsed once in PBS, and suspended in 60µL of cell free buffer. 5µL were used for PARP proteolysis analysis. PARP sample was loaded on 6% polyacrylamide gel and proteolysis checked by Western blot technique. Protein samples and molecular weight markers were separated by polyacrylamide gel electrophoresis for 1 hour at 100 volts. Protein samples were transferred from polyacrylamide gel onto nitrocellulose membrane using electroblotting apparatus set for 100 volts for 1 hour. Nitrocellulose membrane was blocked for 1 hour with TBST 5% milk solution at room temperature. Nitrocellulose was washed three times in TBST for 10 minutes each. Nitrocellulose membrane was incubated for 60 minutes with primary antibody (either anti-PARP or anti-cytochrome c). Nitro-cellulose membrane was washed three times in TBST for 10 minutes each. Incubate with secondary antibody peroxidase conjugate (goat-anti-rabbit for PARP and goat-anti-mount for cytochrome c) for 60 minutes. Nitrocellulose membrane was washed three times in TBST for 10 minutes. ECL reagents were added to nitrocelulose membrane. Film was developed within 1 minute of adding reagents. Treatment of cells with cell permeable ceramide triggers activation of the ICE-like protease CPP32, which causes proteolysis of PARP. Hence, apoptosis was measured by determining PARP proteolysis. The calyculin was used as a phosphatase inhibitor. Rotenone blocks complex one of the electron transport chain in the mitochondria and was thus used to test for mitochondrial function in apoptosis. Molt-4 leukemia cells were treated for 0, 2, 4, 6 or 8 hours with 20μM C6-ceramide. As seen in Figure 1, the upper-most bands in each column show the intact PARP. In the control column (column 1), no PARP cleavage is seen. In column 2, with only two hours of ceramide treatment, no PARP cleavage is seen either. In columns 3-5, increasing time courses of ceramide show an increasing density of cleaved PARP fragments. In column 6, cells left alone for 8 hours (no treatment) show no PARP cleavage. The remaining molt-4 cell suspension was lysed for 10 minutes at 450 psi. 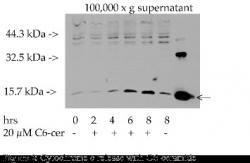 The 100,000 x g supernatant of the suspension was then separated and loaded on to a gel for cytochrome c release indication. Addition of anti-cyrochrome c as a primary antibody and goat-anti-mouse as a secondary antibody tagged cytochrome c.
The band at 15.7 kDa seen in Figure 2 shows the release of cytochrome c. Column 7 was loaded with a cytochrome c standard to clarify that this antibody tags cytochrome c. In the control column (column 1), faint cytochrome c release is seen. In column 2, with only two hours of ceramide treatment, similar levels of cytochrome c release is seen. In columns 3-5, increasing time courses of ceramide show an increasing density of cytochrome c release. In column 6, cells left alone for 8 hours (no treatment) show little cytochrome c release. Molt-4 leukemia cells were co-treated with 20μM C6-ceramide and varying concentrations of calyculin for 8 hours. PARP. Again the control column (column 1) shows no PARP proteolysis. 0.3μM calyculin in column 3, PARP is cleaved with ceramide. calyculin inhibits PARP proteolysis (as seen by lack of PARP fragment). polyacrylamide gels and PARP proteolysis detected by Western blot. PARP. In the control column (column 1), no PARP cleavage is seen. In this report, the role of the mitochondrion and phosphatases in apoptotic signaling was investigated. To study the direct involvement of the mitochondrion in ceramide induced apoptosis, we used molt-4 leukemia cells. The involvement of phosphatases in the ceramide induced apoptotic pathway was similarly studied using the same cell line. Our conclusions were three-fold: 1) ceramide causes the release of cytochrome c, 2) calyculin A (a phosphatase inhibitor) blocks PARP proteolysis, and 3) the electron transport inhibitor rotenone (at complex one) has no effect on PARP proteolysis. Previous experiments with L929 cells have implicated the role of ROS from mitochondria in cell death (Matthews, 1983 and Schulze-Osthof et al., 1992). Yet, contradictory results from the same cell type have been demonstrated by using a mitochondria deficient cell line (Schultze-Osthof et al., 1993). The latter experiments results, although seeming contradictory, may be supportive of the former experiments. Using a cell line with deficient mitochondria may cause an increase in the number of ETS per mitochondria to compensate for low ATP levels. This, in turn would sustain normal ROS levels which have been implicated as possible mediators of apoptosis (Lennon, 1991). Further more, Higuchi et al have shown that mitochondria respiration is necessary for the induction of apoptosis by physiological stimulants such as serum starvation (1997). apoptosis, favors the hypothesis that the mitochondria plays a role in ceramide dependent apoptotic signal transduction. Yet blocking of complex one on the electron transport chain in the mitochondria by rotenone led to inconclusive data. While increasing the concentration of rotenone decreased PARP proteolysis, the level of PARP cleavage was still greater than without any rotenone at all. It may be that the ceramide pathway bypasses complex one of the ETC. Further studies blocking complexes further along the ETC are required. Previous to this report, it was known that ceramide directly activated a phosphatase known as CAPP (ceramide-activated protein phosphatase) and indirectly activated caspase-3. Although both had been implicated in ceramide-induced apoptosis, it was not known if they were part of divergent ceramide-signaling pathways or the same pathway. These studies provide evidence for CAPP acting upstream of caspase-3 on a linear pathway (see Figure 5). 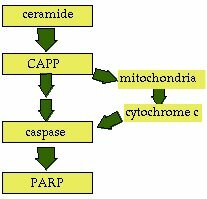 The mechanism by which CAPP activates caspase is unclear but we hypothesize that the mitochondria and cytochrome c release is involved. Experiments are now in progress to understand the method in which the mitochondrion links CAPP to caspase activation. 1. Clarke A.R., Purdie C.A., Harrison D.J. 1993. Thymocyte apoptosis induced by p53-dependent and independent pathways. Nature. 362: 849-852.